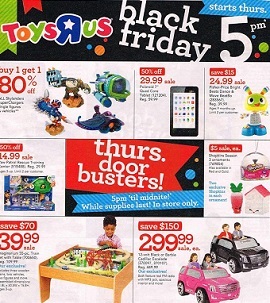 Check Toys R Us Black Friday Sale Ad 2015. Toys R Us Black Friday Store Hours: sales starts Thanksgiving Day at 5PM, and Friday from 7AM. Babies R Us stores will be open from 8AM on Black Friday. Shop online – from 9AM EST Thursday. Toys R Us doorbuster deals: $24.99 Fisher-Price Bright Beats Dance & Move BeatBo; $299.99 Power Wheels Barbie 12V Cadillac Escalade Ride On; $23.99 Fisher-Price Little People City Skyway; $24.99 VTech Alphabet Activity Cube; $59.99 LeapFrog LeapTV Active Video Game Systems + LeapFrog LeapTV Game; $10 Crayola Super Art Coloring Kit; $29.99 Disney Frozen Singing and Talking Elsa and Anna Plush Doll; $19.99 Razor Jr. Kiddie Kick Scooter; $59.99 Carrera Remote Control Video Streaming Drone; $299.99 Xbox One The LEGO Movie Video Game Bundle; $279.99 Wii U Super Smash Bros & Splatoon Deluxe Set; $12.99 Barbie Doll Fashion Set w/ Barbie Doll; $14.99 Lego Duplo LegoVille My First Shop; $59.99 Stats My First Trampoline. Find all Toys R Us Black Friday 2015 deals, offers and doorbusters.